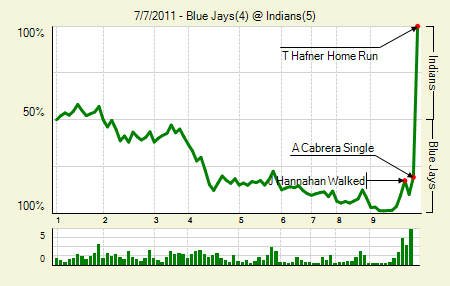 Moving the Needle: Travis Hafner walks off with a grand slam, +.807 WPA. I had this one all written up. It was bottom of the ninth, Indians down 4-0, and I wrote up some lousy Rajai Davis RBI single. Next thing I know there’s this long orange line on the scoreboard, and I’m busy hitting the delete key. The Indians got a single, double, and walk to start off the bottom of the ninth, chasing Frank Francisco from the game. Apparently John Farrell had seen that movie before, as most of us have, and got him out before he could completely blow the game. Luis Perez came in and got the first guy he faced, but then allowed a single to Asdrubal Cabrera before Hafner took him deep — way deep — for the game-ending grand slam. That was Hafner’s third hit of the night. Carlos Villanueva: 6 IP, 6 H, 0 R, 2 BB, 7 K. He allowed an additional base runner via a hit by pitch, and threw a wild pitch — which just adds to the marvel that was his zero-run performance. That’s the fourth time in 36 career starts that he’s allowed zero runs in six or more innings, but the first time since 2007. He did it twice in 2006. Jose Bautista: 1 for 4, 1 HR, 1 BB. Hey, it’s the old Joey Bats checklist. Moving the Needle: Bobby Abreu ties the game with a single, +.164 WPA. 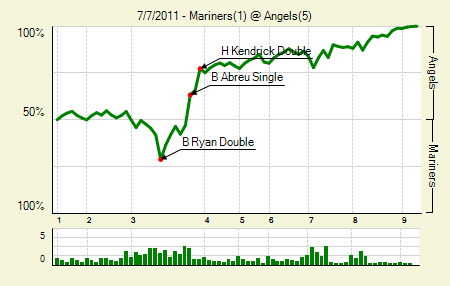 After the Mariners worked across a run in the third, the Angels answered them right back. Jeff Mathis walked to start the inning, and two batters later the Angels went to work. A pair of singles, the second of which was an Abreu ground ball single past the first baseman, tied the game at one. A sac fly brought home another, and then a double made it 3-1. The scoring died down from there, though the Angels did tack on late in the game. Jered Weaver: 9 IP, 6 H, 1 R, 1 BB, 6 K. Even against the Mariners offense this is a phenomenal start. After the third he really settled in, allowing just three hits and walking none. Peter Bourjos: 3 for 4, 1 2B. He drove in a run late in the game, but ended up straining his hamstring rounding second base. That opens the door for Mike Trout, who at age 19 will make his major league debut tonight. Moving the Needle: Freddy Freeman continues his tear with a three-run homer, +.229 WPA. Jason Giambi got started right, with two RBI in the first three innings, but it was the Braves first baseman who would steal the show. After Jordan Schafer led off the bottom of the third with a ground rule double the Braves went to work, getting two singles to bring home Schafer and set ’em up for Freeman. He lifted one out of the park, turning a 2-1 deficit into a 4-2 lead. Two more hits added another run and gave the Braves control of the game. Jason Heyward: 3 for 4, 1 HR. 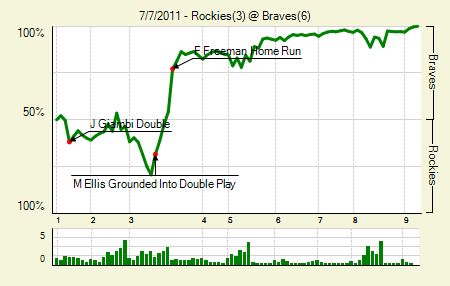 His solo homer put the Braves up by four, but the Rockies scavenged a run later. It’s a good thing, too, because it led to Craig Kimbrel break the first half rookie saves record. Which, of course, is a very prestigious honor. Tim Hudson: 7.1 IP, 5 H, 3 R, 3 BB, 3 K. He induced 15 ground balls and let just six leave the ground. That’s a nice little ratio if you’re not going to miss many bats. 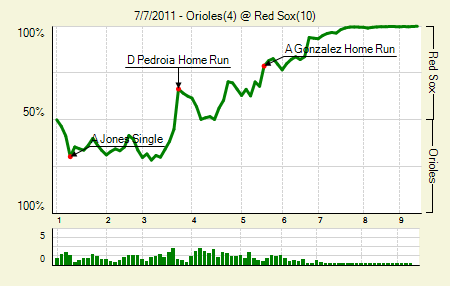 Moving the Needle: Dustin Pedroia’s three-run homer erases an early deficit, +.215 WPA. Andrew Miller ran into immediate trouble, allowing three straight singles to lead off the game. The Orioles pulled two runs out of the inning,but the Sox got them back in the third. After a pair of walks put runners on first and second, Pedroia got hold of a high fastball and hit it all the way out of the park to give the Sox a 3-2 lead. The Orioles would tie it in the next half inning, buu the Sox immediately retook the lead and then piled it on the rest of the game. Six of their nine starters hit a home run. Jarrod Saltalamacchia: 2 for 4, 1 HR. That’s his first homer in over a month, though his numbers still look decent, at least for a catcher (.329 wOBA). Jacoby Ellsbury: 1 for 3, 1 HR, 2 BB. He has 25 doubles and 11 homers on the season. Moving the Needle: Mike Stanton shows off his power with a two-run shot, +.161 WPA. The Marlins put a couple of runners on in the first, but they couldn’t bring any of them home. In the second Mike Cameron led off with a walk, and then Stanton hit a mammoth shot over the left field wall to give the Marlins a 2-0 lead. That’s all they’d need, as the Astros came up lame all evening, failint to get a runner even to second base. Which is fine. It gives me a chance to ask the super obvious question: why the hell is Mike Stanton hitting seventh, and why the hell is Mike Cameron batting ahead of him? If your batting order has Emilio Bonifacio and Omar Infante at the top and Stanton seventh, it might as well be picked out of a hat. Brad Hand: 7 IP, 2 H, 0 R, 3 BB, 4 K. The peripherals are anything but there, but the results are there right now. At least he didn’t allow a homer in this one. He had allowed six in his first four starts. Logan Morrison: 2 for 4, 1 2B. He drove in two insurance runs later in the game. 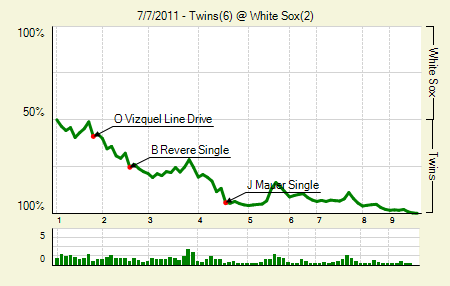 Moving the Needle: Joe Mauer opens it up big time with a two-run single, +.077 WPA. The Twins started the run scoring early, getting one in the first and then two more in the second. In the fourth they piled on some more, going up 4-0 with one out, and then getting another two when Mauer singled with two outs. One run scored easily, and another came home when Paul Konerko tried to get a little cute and flip the ball to first after cutting off the throw from right. At 6-0 the Twins had little trouble the rest of the way. Ben Revere: 3 for 5. He scored two and drove in two. Carl Pavano: 7 IP, 6 H, 2 R, 2 BB, 4 K. He’s gone at least seven innings in nine of his last 10 starts. Hector Santiago: 4.1 IP, 1 H, 0 R, 1 BB, 1 K. In just his second big league appearance he pitched some mighty fine mop-up innings when it was clear that Philip Humber didn’t have much of anything. 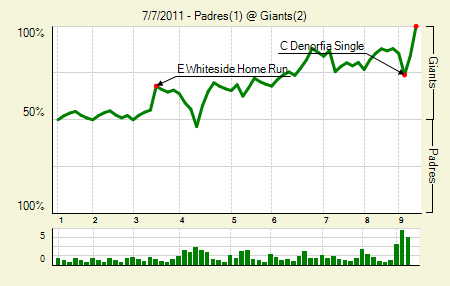 Moving the Needle: Matt Kemp’s two-run double puts the Dodgers up by three, +.114 WPA. It took their ace keeping their opponents off the board, but the Dodgers avoided a sweep against the Mets last night. They took an early 1-0 lead, but ensured the victory in the sixth when they put five on the board. The first two came off the bat of Kemp, who lined one to left with runners on first and third. It was far enough away from Jason Bay that both runners could score. 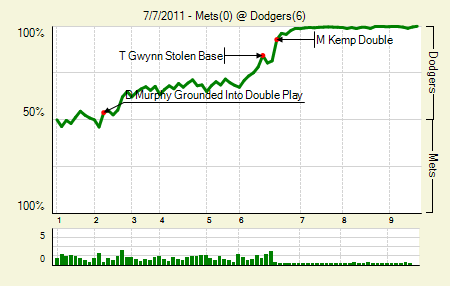 Kemp scored when the next bater doubled, and then a double and a triple later in the inning made it 6-0. Clayton Kershaw: 8 IP, 5 H, 0 R, 2 BB, 9 K. In four of his last starts he’s pitched at least eight innings. Aaron Miles: 1 for 3, 1 2B. He drove in a pair, and is 11 for his last 27 with four doubles and a homer. Moving the Needle: Rickie Weeks hits a three-run bomb to put the Brewers ahead in the fifth, +.253 WPA. 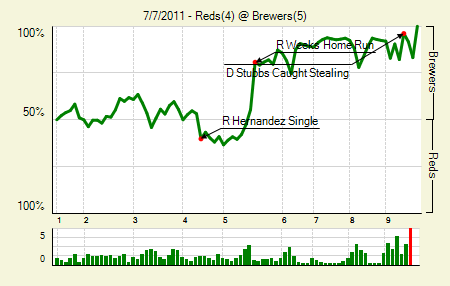 The Reds scored in the third and the fourth to take a 2-1 lead, but in the fifth the Brewers got it all back. They started the inning with a single and a walk, and then Weeks lined one over the wall in center, sending Bernie Brewer down the slide and giving his team a 4-2 lead. They’d get another in the inning, which helped fend off the comeback try by the Reds. Chris Narveson: 6 IP, 7 H, 2 R, 2 BB, 5 K. That’s the line from a Narveson start if I’ve ever seen one. Few too many base runners, wiggling out of some trouble, decent K/BB. OK, only sometimes he wiggles out of trouble. Ramon Hernandez: 2 for 4, 1 HR. He hit a solo shot to bring the Reds to within one in the ninth. Moving the Needle: Ryan Raburn gives the Tigers an early lead with a two-run shot, +.183 WPA. 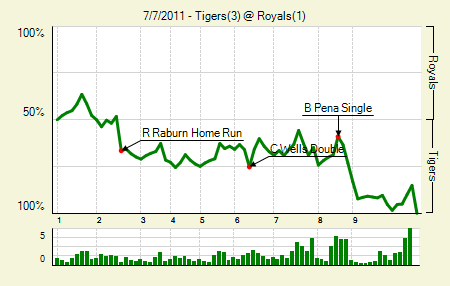 Miguel Cabrera walked to start the second, but the next two hitters recorded outs. That left things up to Raburn, and after a good at-bat he pulled one into the bullpen in left. It was huge for Raburn, as he’s hit horribly this year. It was huge for the Tigers, too, as it was the difference. Don Kelly: 1 for 1, 1 HR. Not bad for a defensive replacement. Max Scherzer: 6.2 IP, 6 H, 1 R, 0 BB, 2 K. He’s had a few starts like this in 2011, but there have been far too many six- and seven-run outings lately. 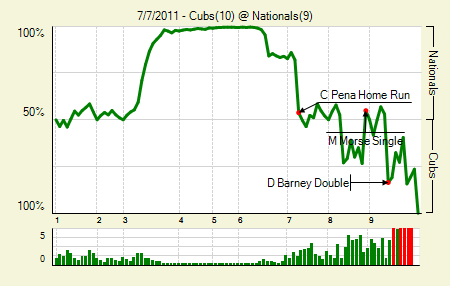 Moving the Needle: Darwin Barney completes the comeback with an RBI double, +.366 WPA. When the Nationals put together a monster seven-run third, the game appeared all but over. They had absolutely tattooed Matt Garza, recording seven hits against him without making an out. They even extended the lead to 8-0 the next inning. But then came the Cubs. They put together a big inning of their own, a six-run sixth that included a Barney two-run double. When he came up in the ninth the game was tied, with a runner on second and two outs. On the fifth pitch of the at-bat he shot one to right just inside the foul line, which was easily enough to score the runner from second. The fireworks didn’t end there, as the Nationals had a runner on third with one out, and eventually second and third with two outs, in the ninth. But Carlos Marmol closed the door on what was quite a Cubs victory. Carlos Pena: 1 for 5, 1 HR. He had the two-run homer that tied the game at eight. Roger Bernadina: 3 for 6, 1 2B. He scored two and drove in a run. He also had one of just three Nationals extra base hits. Blake DeWitt: 1 for 1, 1 HR. His three-run pinch-hit home run was a huge part of the comeback effort in the sixth. 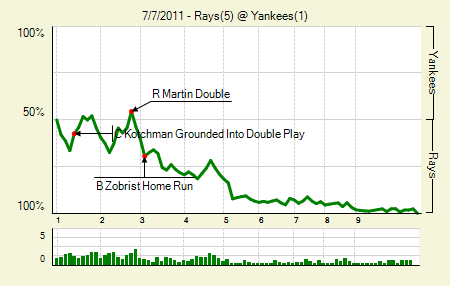 Moving the Needle: Ben Zobrist homers to put the Rays up 2-0, +.093 WPA. 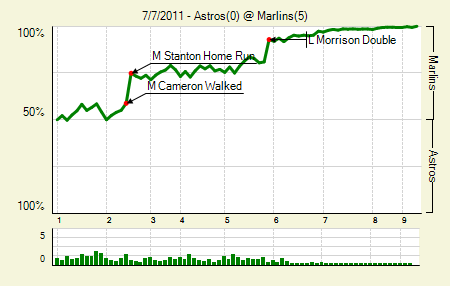 The Rays controlled most of this game, picking up a run in the first and then a pair in the third. Zobrist started the scoring in the third with a solo homer to right, his 10th of the season. The Rays got one more than and then two more in the fifth, which set them up for a W against their division rivals. Jeff Niemann: 7.1 IP, 6 H, 1 R, 2 BB, 4 K. That’s four very good starts (out of five) since coming off the DL. His only blemish was a homer to Robinson Cano, which is forgivable. B.J. Upton: 2 for 4, 1 HR. He drove in three, including two with the homer. Moving the Needle: Justin Upton’s two-run bomb puts the Diamondbacks up by three, +.193 WPA. Earlier in the week someone in the TMA comments asked why, despite not elite power numbers, I wanted to see Justin Upton in the HR derby. If you watch the replay of his homer from last night, you’ll see why. It didn’t clear the fence by a ton, but it looked absolutely slaughtered off the bat. He also has two of the top 10, and four of the top 25, longest homers of the year, per Hit Tracker. In any case, his homer in the sixth extended the DBacks lead and led them to eventual victory. Matt Holliday: 1 for 3, 1 2B, 1 BB. He drove in a run a half-inning after Upton hit the homer, but it wasn’t nearly enough. 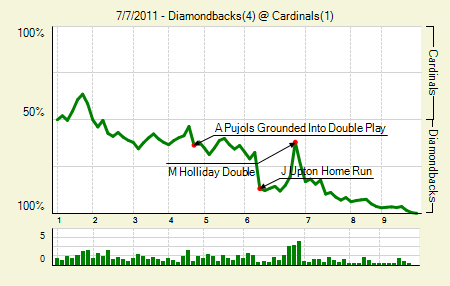 The rest of the lineup didn’t exactly come through, and the hitters behind Holliday went 0 for 16 with two walks. Diamondbacks pitching: 9 IP, 3 H, 1 R, 6 BB, 3 K. It’s tough to credit Joe Saunders with a five-inning, four-walk performance, though he did allow only one hit in that span. He also struck out only one. Moving the Needle: Josh Hamilton drives home the second run, +.079 WPA. Sometimes you just keep edging that needle little by little. 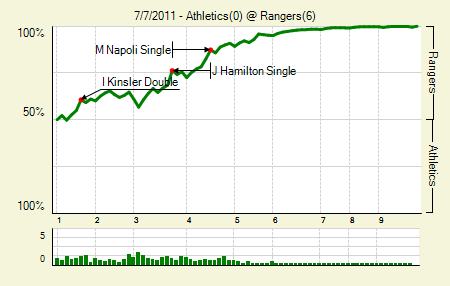 That’s what the Rangers did last night, scoring runs one at a time. Hamilton brought home the first on a ground out, and then two innings later drove in the second with a grounder past a diving Chris Carter. He drove in a third, the fourth run of the game, on a sac fly an inning later. Ian Kinsler: 2 for 4, 1 2B, 1 BB. His average is a bit down this year, but he’s really stepped it up with the power. That was his 20th double. Derek Holland: 9 IP, 4 H, 0 R, 2 BB, 7 K. Despite his funky numbers this season, he has had comparable starts. Against Cleveland about a month ago he threw a complete game shutout as well. It seems like he’s close to getting on track. Moving the Needle: Chase Headley grounds into a game-ending double play, -.157 WPA. When Pat Burrell singled home Miguel Tejada in the bottom of the sixth, the Giants had a 2-0 lead and appeared on their way to victory. But then Ryan Ludwick homered in the top of the seventh to give the Padres some life. In the ninth they got a leadoff single from Chris Denorfia, but after Jason Bartlett hit into a fielder’s choice, Headley grounded one to third and started a 5-4-3, game-ending double play. Barry Zito: 8 IP, 4 H, 1 R, 0 BB, 7 K. In his three starts back from the DL he’s gone 21 IP, 13 H, 3 R, 4 BB, 11 K. It’s too soon to make any determinations, but if he’s finally gotten even a fraction of his old groove back, the Giants just got that much more dangerous. Corey Luebke: 6 IP, 5 H, 2 R, 1 BB, 8 K. Is it just me, or does San Diego have a knack for picking guys out of the pen and making them starters? We hoped you liked reading The Morning After: Game Recaps for July 7th by Joe Pawlikowski! +.807 WPA – that’s nuts. Does anyone know what was the biggest WPA swing ever? I can’t imagine that it gets much higher than that, but then again, I haven’t known about WPA for more than a few months. I was wondering the same thing. I imagine the WPA would have been slightly larger if the slam had come with two outs instead of one, which is the maximum possible WPA swing, right? Theoretically, I don’t think it matters how big the deficit is as long as the tying run is on 1st, since so a 1-run deficit with a man on first, or a 2-run deficit with 1/2 or 1/3, or a 3-run deficit with bases loaded ought to all be about the same (in every case you’ve got to get the man from 1st to score). There will be an empirical difference since Win Expectancies are generated from actual data and the situation doesn’t arise all that often. It’s also worth considering the possibility of stolen bases which doesn’t arise when the bases are loaded. Also, the more runners there are on base, the higher a chance one might get thrown out on the base paths. I would think that down 1 with a man on first has a higher win expectancy than bases loaded down 3.